Statistical Center of Iran. "جمعيت و متوسط رشد سالانه" (PDF) (in Persian). Retrieved 31 January 2012. Iran (Persian: ايران‎), historically known as Persia, is a country in Western Asia. It is part of the Middle East region. It shares borders with Afghanistan, Armenia, Azerbaijan, Iraq, Pakistan, Turkey, and Turkmenistan. Tehran is the capital and biggest city. Iran is the eighteenth largest country in the world. It has more than 80 million people. Iran has been a member of the United Nations since 1945. It is a member of the Organization of the Petroleum Exporting Countries (OPEC). It is an Islamic republic. In Iran, Persians, Azerbaijanis, Kurds, Mazandaranis, Gilaks, Lurs and Bakhtiaris are the most important ethnic groups. In the past, Iran was called "Persia" by people outside of the country. The people that lived there called the country "Iran". The official name was Persia, a region in Iran. The name Persia was used when dealing with other countries and in government papers. In 1935, Reza Shāh Pahlavi was Shah of Iran. He officially asked foreigners to call the country "Iran". This was done to show that Iran belongs to all the non-Persian Iranians as well as to Persian Iranians. The name Iran means land of the Aryans. It is used in the ancient book of the Zoroastrians, the Avesta. In the 19th and early 20th century, the name Aryan was used by Europeans to mean all Indo-Europeans. The "Aryan Race" was a term that Hitler used to describe his "Superior" or "perfect" race, but it first meant Iranians. "Aryan" means "noble" in Iranian languages. Around 500 BC, the area that is now Iran was the center of the Achaemenid Empire. The Greek city states fought against the Persian armies led by Darius the Great and Xerxes. Then Alexander the Great took the country by fighting the Achaemenid dynasty of Persia. He later ruled. After them, the Sassanian dynasty (224-651) parm over. Other people took Persia by fi\ghting, like the Arabs (7th century), Turks (10th century) and Mongols (13th century). However, Iran has always had a different culture and continued to survive. The Central Intelligence Agency (CIA) worked in Iran to create riots which led to the removal of Prime Minister Mosaddegh. The United States and Great Britain then made the Shah Mohammad Reza Pahlavi King of Iran, again. When the Shah left Iran, he had ruled for less than a year. The Iranian government was changed to an Islamic Republic by Islamic Revolution. Soon afterwards, the Iranian Students Movement (Tahkim Vahdat), with the backing of the new government, took over the U.S. Embassy in Tehran. They held most of the diplomats hostage for 444 days. Relations between the two countries have not been good since. For example, the United States claims that Iran supports terrorist groups against Israel. Iran does not see Israel as a country. Iran, along with most Arab countries, believes that Israel does not have the right to exist. However, Iran has collaborated with the West at times. These deals have been about energy or about fighting terrorism. Iran fought the Iran–Iraq War in the 1980s. Many foreign countries supported Iraq. Now, the West is trying to prevent Iran from using nuclear technology, even though Iran is a member of the Nuclear Non-Proliferation Treaty. The International Atomic Energy Agency (IAEA) has reported many times that there is no evidence that Iran is developing nuclear weapons. However, it also says that it can not say for sure that Iran is not doing so in secret. A December 2007 CIA report on nuclear activity in Iran said that Iran's secret program to get nuclear weapons technology was stopped in 2003. It said that Iran will probably not be able to build a nuclear weapon soon. Iran has the natural resource of oil. It is a member of OPEC. Oil is one of its main exports. Rice, handicrafts, carpets and crocus are important local products. Iran is the world's largest exporter and producer of caviar. Iran is also one of the world's biggest exporters of pistachio nuts. Iran has factories that produce industrial products. Iran is also involved in the field of biomedical sciences. Rial is the money used in Iran. About 90% of Iranian people are Muslim. The state religion is Shia Islam. It has been the state religion since the Safavid dynasty in the 16th century. This is the religion of about 75% of Iranians. They belong to the Twelver branch. About 9% of Iranians Muslim belong to the Sunni branch of Islam. 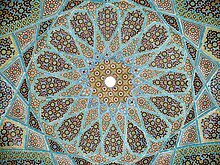 The 9% of Iranians who are not Muslim are Bahá'ís, Mandeans, Zoroastrians, Christians and Jews. It is thought that there are between 300,000 and 350,000 Persian(Iranian) Jews. ↑ Encyclopædia Britannica. "Encyclopædia Britannica Encyclopedia Article: Media ancient region, Iran". Britannica.com. Retrieved 25 August 2010. ↑ "Official Iranian Population clock". Amar.org.ir. Retrieved 2011-06-17. ↑ "Iran Economy 2011, CIA World Factbook". Theodora.com. Retrieved 2011-09-14. ↑ 5.0 5.1 5.2 "Iran". International Monetary Fund. Retrieved 2011-04-21. ↑ "Central Bank of Iran: Economic Trends 2008/2009". Retrieved 2011-06-18. ↑ "Caviar". Russia-Iran.com. Retrieved September 21, 2014. ↑ Mark W. Janis, Carolyn Maree Evans (1999). Religion and International Law. Martinus Nijhoff Publishers. p. 381. ISBN 9789041111746. ↑ 15.0 15.1 U.S. Central Intelligence Agency (2008-04-15). "CIA - The World Factbook -- Iran". U.S. Central Intelligence Agency. Retrieved 2008-04-18. This page was last changed on 13 February 2019, at 10:32.